The prize: a Michelin-starred meal for under ¥1,000. The catch: you have to get there before 8am on the same day to guarantee yourself one of the spaces at the counter. Is it worth it? Of course it is. In a city of thousands of ramen joints Tsuta is number one, and it’s got a gong sitting on top of a fridge to prove it. Japan’s first starred ramen joint attracted long queues even before the Michelin men came knocking on the door because chef Yuki Onishi – who can now be seen modelling a ¥4,900 souvenir T-shirt on an ad at the top of their vending machine (surely a little bit of fame is allowed to go to their heads?) – is a ramen perfectionist. To the hushed reverie of the nine counter customers (any empty seats at this Sugamo joint are rapidly filled) Onishi prepares soup bowls with measured, almost balletic grace; a dash of black truffle here, some enoki mushrooms there. 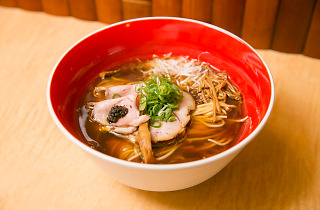 The broth, made from a blend of soy sauces, is rich and complex, while the soba noodles are firm and smooth with a clear, nutty flavour, and the pork is roasted to juicy perfection. There’s only one drawback, and it’s not the early start or the strict rules (no photos of the kitchen, only one bowl per person etc). 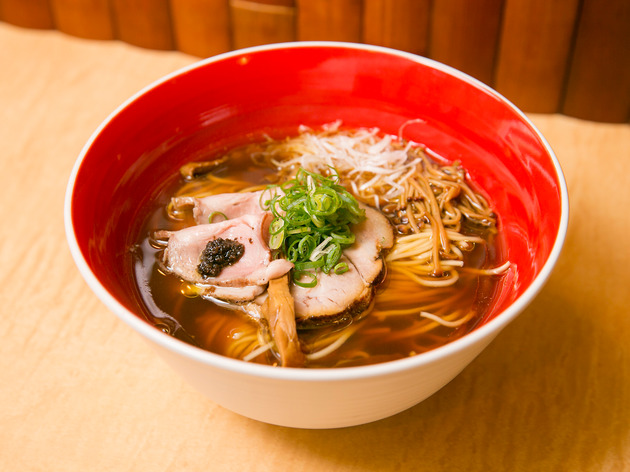 It’s that you’ll be ruined for life – no bowl of ramen will ever live up to it. As noted in the review, Tsuta is currently operating on an entrance ticket system. Tickets for set time slots are distributed at the shop from around 7am, and you'll need to pay a ¥1,000 deposit in order to receive a ticket. No tickets are needed from 4pm; you'll just have to queue up and hope there's still some soup left in that case.